Want more Twitter followers? How about Facebook or Instagram fans? Begging for blog readers? If yes, keep reading and prepare to uncover some superstitions and myths and all the things you may be doing wrong. “Going viral is black magic. It’s nothing you can prepare for it or duplicate again,” says Dan Zarrella, Hubspot’s Social Media Scientist. In his presentation The Science of Social Media at Inbound14 last month, Dan shares his vast amount of experience via graphs, heat maps and voodoo dolls. Check out some of his actionable practice for you to start testing right now. If you’re only throwing your tracking links at the end of your tweets you may be missing out big time. Here you see a heatmap of a 140 character tweet. The hot spot to gain a click is about the 25% mark, as shown in the hot pink area noted in the image, below. Choosing the right filter is actually more important than you think. As you can see in the following slides, desaturated photos, or photos with muted tones, are actually shared more frequently than those that are saturated. Also, desaturated photos, tend to be engaged with more frequently than those that are highly saturated. Are warm colors better for photos? Although you might feel like warm and fuzzy photos go over better, that’s actually not the case. According to Dan, cooler colors tend to be shared more frequently than warmer ones. Also, the less luminant, the better. This may not work for your brand but it’s certainly worth testing! I know, it feels funky but Dan says that asking people what you want them to do (tactfully) will help you see a spike. Including the words “like, comment, share” will give you more shares. Tell people what you want to do. Also, use Dan’s most retweetable words for more bonus points. With so much on our plates throughout the work week, sometimes we find ourselves ignoring social media altogether. More than likely you’re not taking full advantage of the weekends when you may have more of people’s time and attention. 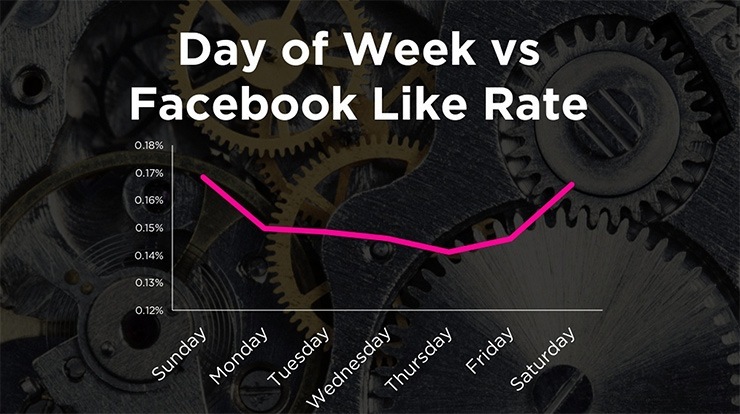 Expanding your social posting and interaction to the weekend is a great way to experiment with contra-competitive timing. “The day of week or time of day are extremely important,” says Zarrella. Check out this slide. For more, check out DanZarella’s full slideshow and be prepared to be amazed. He has data around optimizing your social media tactics like Pinterest as well as blogging and email marketing. It was extremely compelling and provided a great deal of insight that you can put into action right now. Thanks for reading!